Here’s a list of all job categories in which jobs are divided on HVAC Jobs Center. Multiple categories might apply to your situation, so make sure to check them all! Administration jobs aren’t really specific to HVACR and Plumbing, but people with previous experience in our field can be a plus, so why not try here first? Administration jobs include clerical work, reception, accounting and more. 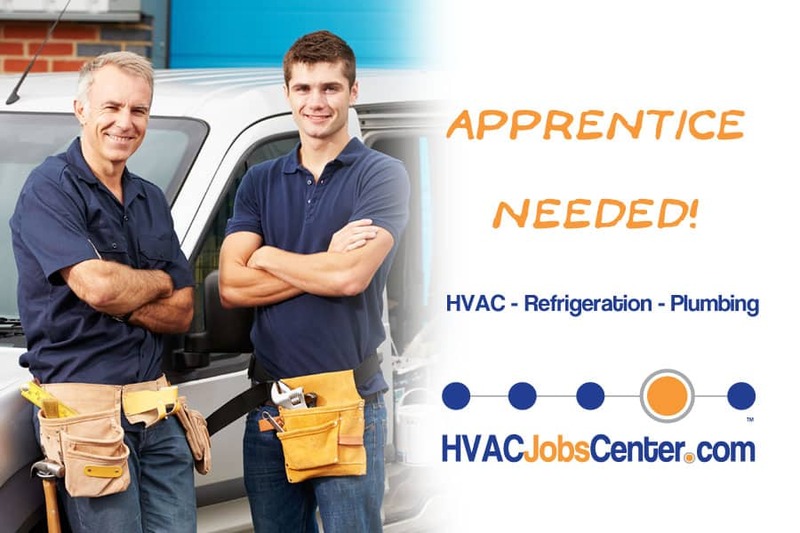 Are you a future Apprentice in HVAC, Refrigeration or Plumbing? Or maybe an employer looking for a new bright apprentice? Our new Apprenticeships category is for you and free to post in! High level management jobs include CEO, CFO, General Manager, VP Sales, Marketing or Operations and other top management jobs. All in HVAC, Refrigeration and Plumbing. HVAC Designers can either be Mechanical Engineers for larger projects, or Experienced Technicians for smaller private projects. These are professions, while HVAC Design is a specialty. HVAC Engineers are Mechanical Engineers who specialized in Heating, Ventilation and Air Conditioning. Most are now also LEED specialists. They are the ones designing the systems and specifying the products. Good HVAC Estimators are a rare commodity. They are the ones reading the plans and making the list of products to quote. They also often calculate the total cost of the project and provide quotes to customers. HVAC Estimation must be accurate as errors can be very costly. HVAC Installers are experts in new construction and HVAC products install. HVAC Installation is one of the various jobs available to HVAC Technicians. HVAC Technicians are in high demand right now on the employment market. HVAC Technicians – also called HVAC Techs – are trained and certified professionals working with heating, ventilation and air conditioning systems and equipment. They can do repairs, maintenance and installation. So also become estimators and sales experts when gaining experience on the field. HVAC, Refrigeration and Plumbing Inside Sales People do sales duties but don’t travel nor visit customers. They stay at the office and support outside sales staff and customers. Depending on their role, they can help with technical questions, pricing, customer support, order processing and more. HVAC Technicians can do a lot of different tasks. Maintenance is one of them. Maintenance Technician Job’s consists in making sure everything runs smoothly, using a combination of preventive maintenance, replacements and repairs. Mechanical Engineers own a bachelor degree in Mechanical Engineering. They know basics of Heating, Ventilation, Air Conditioning, Refrigeration, Plumbing and more, and most are specialized in a specific field. They design HVAC, refrigeration and plumbing systems. Plumbers get your water and drain systems running, but they also do much more than that. Most people see plumbers as professionals who they can call when their home need plumbing repairs. This is why we offer different categories related to Plumbing Jobs. Plumbing Engineers are Mechanical Engineers specialized in plumbing systems, either commercial, residential or industrial. They design the systems that carry, circulate and evacuate water in/from buildings. Plumbing Estimators Job is similar to HVAC Estimators Job, but strictly for plumbing systems. This is a very specialized position and talented and experienced plumbing estimators are always in high demand. Plumbing installers are Plumbers. The difference stands only in the task done. Plumbing Installers are Plumbers doing almost only new installs. They don’t repair or maintain, they specialize in new buildings. HVACR and Plumbing Manufacturers do need employees in Production. A lot of production jobs are very common in HVACR and Plumbing and can be great assets moving from one company to another. For instance sheet metal workers, working with presses and other sheet metal machinery. HVAC, Refrigeration and Plumbing Project Managers are the ones making sure everything falls in place, that proper resources are allocated for the project to be completed within specifications and quality standards, within budget and on time. Refrigeration Installers are HVACR Technicians who specialized in refrigerants and refrigeration systems. They are experienced at installing new systems. Refrigeration Technicians are in very high demand all over the US and Canada. Talented and experienced Refrigeration Technicians are a rare commodity and there are probably more jobs that available candidates right now. Yet it’s all about the perfect fit: the right job for the right person. HVAC, Refrigeration and Plumbing Sales Engineers are usually Mechanical Engineers with strong sales skills and deep technical knowledge of the products. Yes they do know how to sell, but they never say anything that’s not technically true and they can answer most questions. There are many HVAC, Refrigeration and Plumbing Sales Manager Jobs out there, and not enough quality candidates available. Either working for a manufacturer, a distributor, a manufacturer agent, a dealer or a contractor, a sales manager is a sales manager. You do need these exceptional sales skills, but also the ability to grow, inspire and manage a sales team composed with strong characters. HVAC Sales Representative Jobs and Plumbing Sales Representative Jobs not only share common customers, but also a job security that’s pretty rare for sales representatives. One who understands the products and have good established customer relationships will never remain long without a job. Main difference between Sales Engineers and Technical Sales? The degree. Although in a lot of cases, technical sales jobs involve more technical support than actual sales, we also have a category just for technical support jobs. So technical sales jobs should involve tech-savvy HVACR and Plumbing professionals with strong sales skills and responsibilities. Technical support jobs are pretty self-explanatory. These technical specialists provide technical support to customers and sales representatives. Warehousing employees are experts in storing and manipulating products, as well as pulling products off the shelves to assemble orders. Jobs can vary from Warehouse Managers to Warehousing Personnel. All other jobs related to the HVAC, Refrigeration and Plumbing industry.